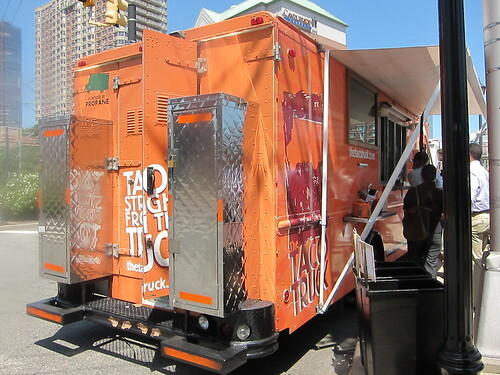 We were on our way to Hoboken to eat sushi when we saw The Taco Truck. I was leaving for the UK the next day. B looked at me and said, “You should eat a taco in New Jersey.” I thought it was a good idea, and that if I had ever decided to eat a taco in every state I would have really regretted the missed opportunity. The menu confused me at first. It said something like this: two soft corn tortillas with your choice of salsa(green, red, chipotle, habanero). Then it listed the meats and the prices: Barbacoa de Costilla $5, Carnitas Michoacan $4.50, al pastor $4.50 etc. I for sure thought this meant one taco with two tortillas. I ordered the barbacoa de costilla with habanero but they were out of habanero. I was gutted. Not for me but for them. Yeah, I love habanero, but they’ll be gutted when they find out they ran out of it the day LA’s taco reporter from the internet was in town. 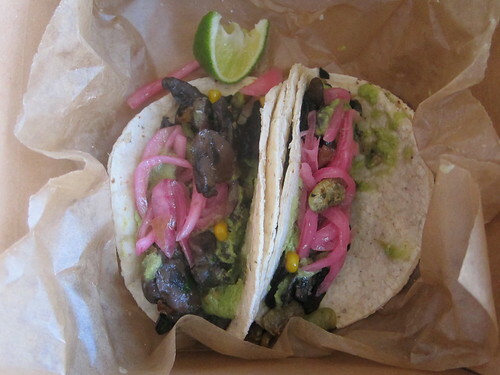 B ordered the hongos (mushroom,vegtable,pickled onion) and we found some shade to eat our taco. Oh wait, not taco, but tacos! 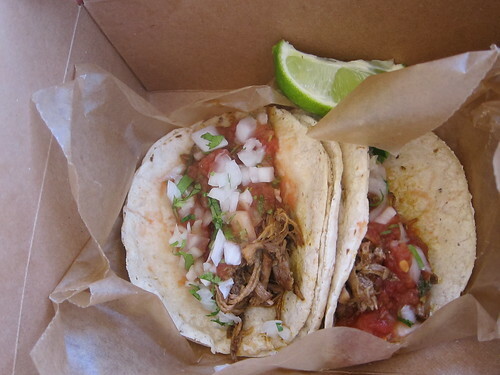 Yes, in fact the two corn tortillas meant two tacos. Then I thought it would have been better to mix and match different meats with different salsas. But it was hot and I wasn’t sure if I misread the menu or if the ordering system was really that limited. B liked her hongos. The barbacoa was juicy and flavorful. The tortillas were fresh. The salsa was medium spiced and I started to hiccup. “ I always hiccup when I eat something spicy,” I said. “I know” B said. “You said that last time”.